I have been dreaming about building a home to live in, on this land, for 8 years now. My plan is to have four domes to live in: a living dome, work dome, sleeping dome and kitchen/bathroom dome. BUT the landlady of the house that I am renting asked me to move out – in a month! It’s a good thing I am a flexible kind of person… I don’t have time right now to build according to my ‘plan’, so I shall just build 2 of the 4 domes. I will use our existing open-air bathroom on the site, and let’s face it, I don’t cook anyway…. So this blog shows the first 2 weeks of the new build. 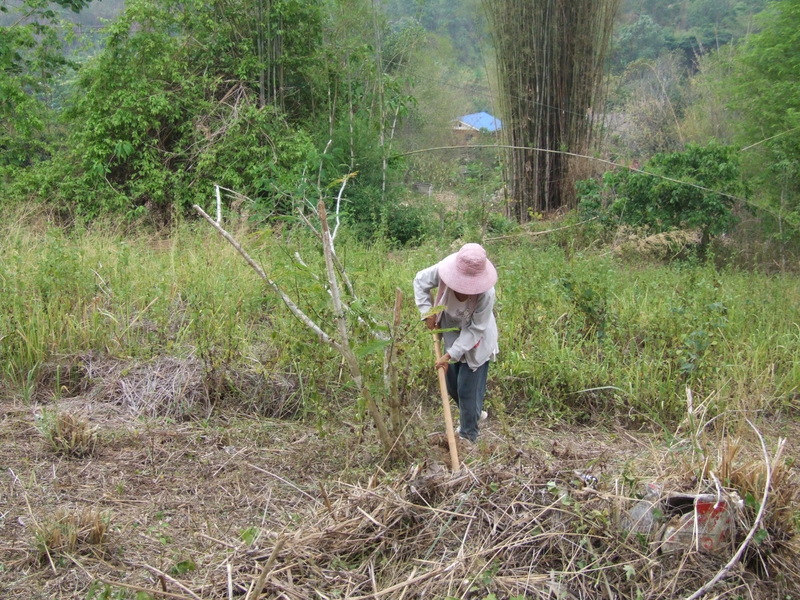 Clearing the undergrowth in preparation for my new home. The preparation for the first structure was not too arduous as it is on the only bit of flat ground on site, the place where a previous owner had a home many years ago. My living room foundations are underway. 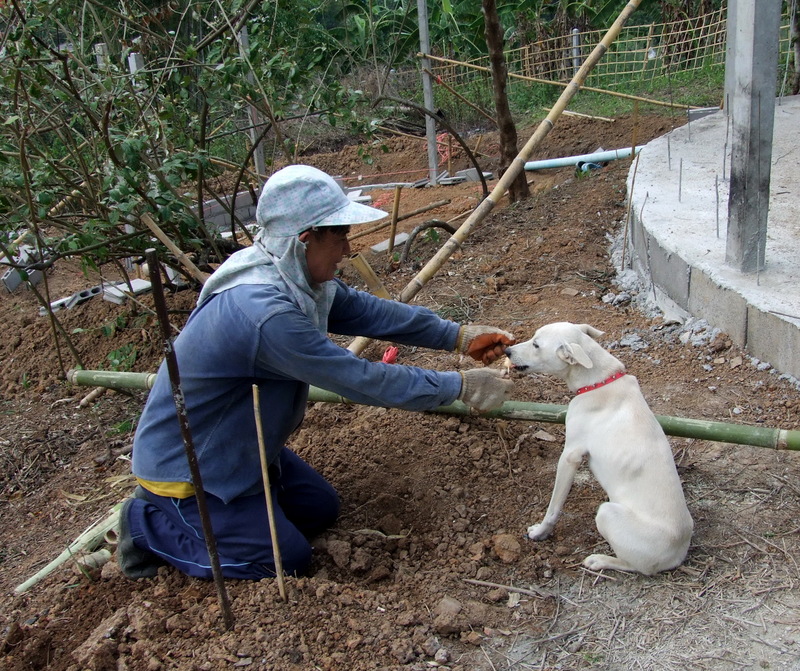 Fixing the bamboo trellis to strengthen the concrete foundation. 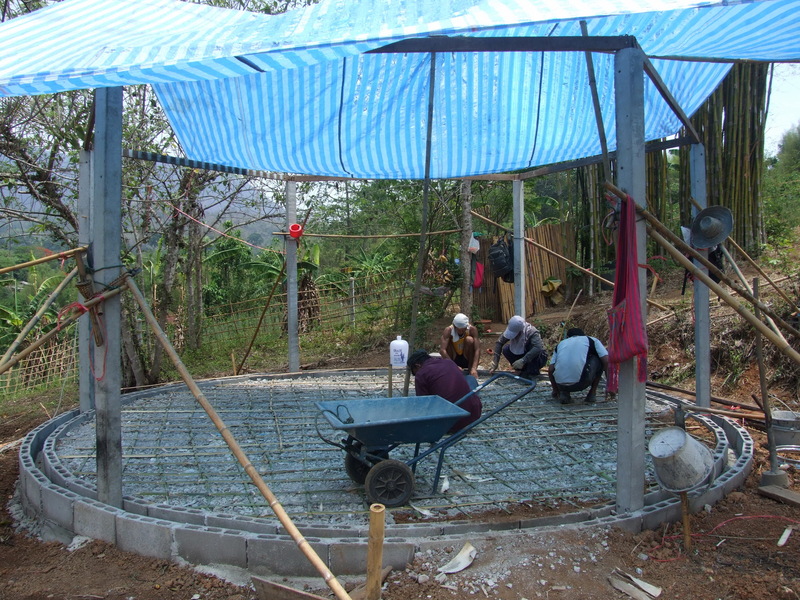 The second structure ground preparation was a real challenge! Not only was the top-soil about 2 feet thick, but also there were deep holes all over it where some creatures have been living. 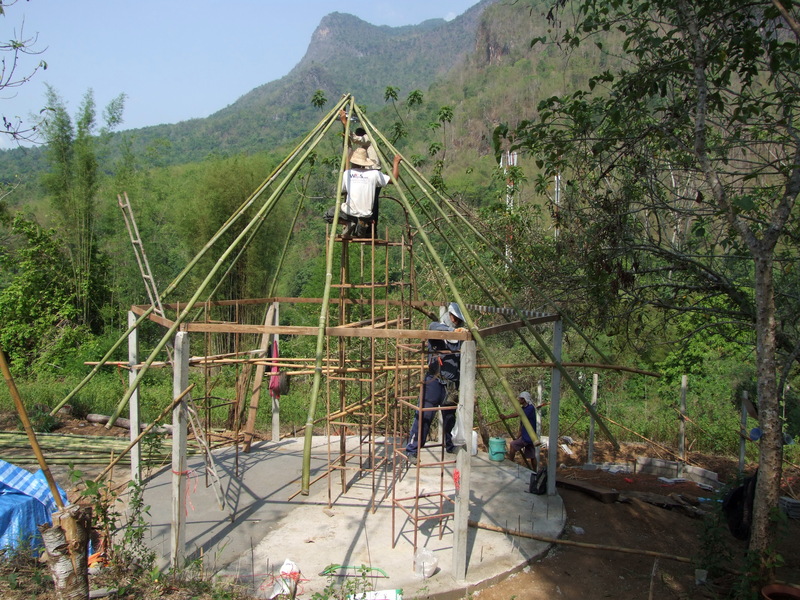 I have not yet been able to understand what creature it is…..
Because of the time constraints, we are going to put bamboo and thatch roofs on these two structures. The ‘sausage’ bags of rice husks take a week to attach in a dome, and then the top of the dome needs to be waterproofed, another week at least. 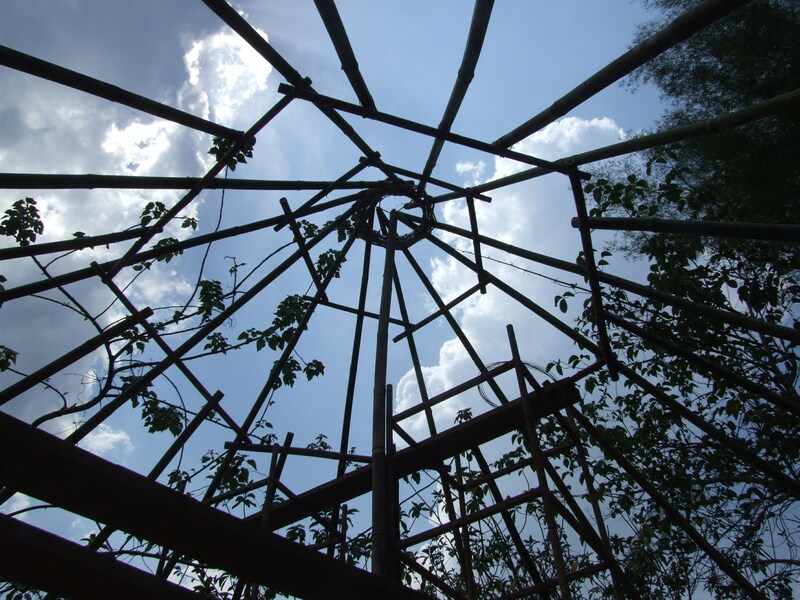 The bamboo poles on which to attach the thatch in this dome took a day to complete and the thatch should, I hope, take 2 days. So these two structures will be roundhouses, rather than domes, but can be converted into domes any time in the future. 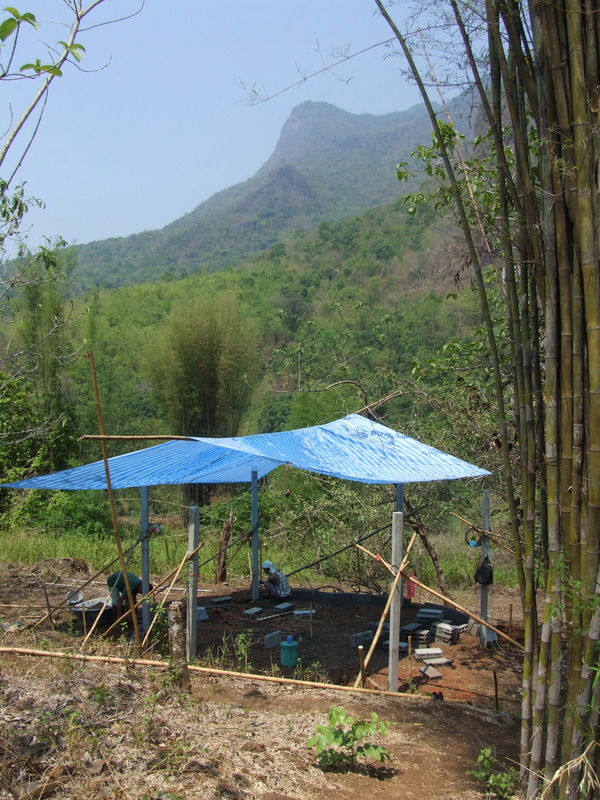 The first bamboo poles go up. You can see the second roundhouse foundations behind, down the hill. 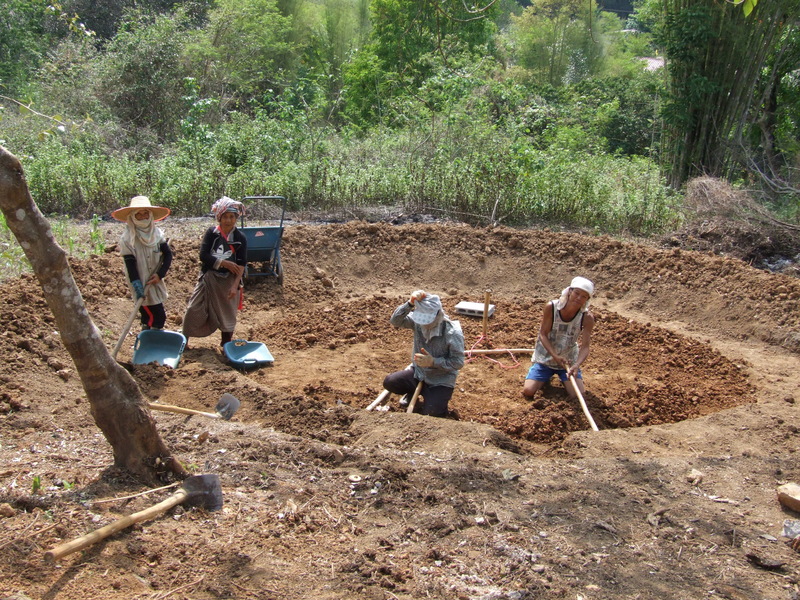 The thatch is being made by a woman in the village with the help of all her female relatives. I followed local advice that if it was made especially for you it would last a lot longer than if just bought in a shop. 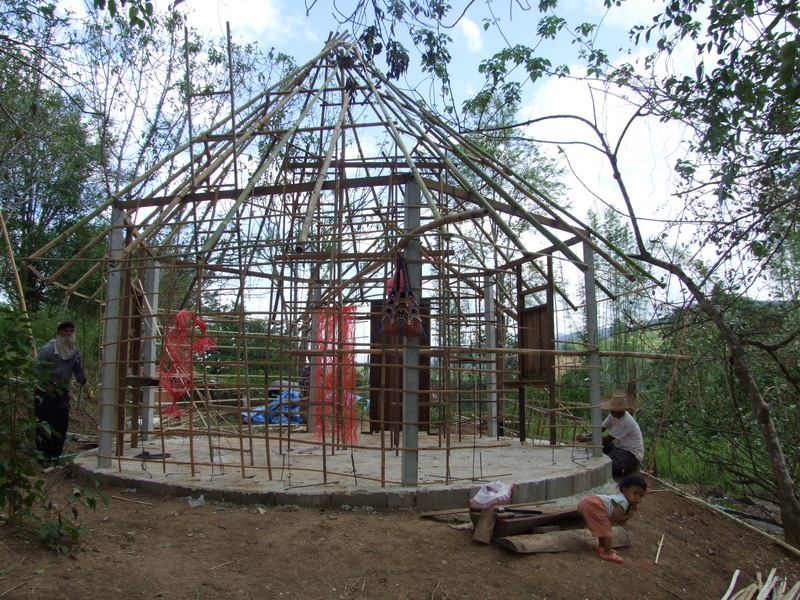 The structure is ready for the thatch. The round thingy in the middle in the picture above is the metal bit from an old car tire which we found in the local recycling yard. I bought 2 of these some time ago, thinking they may come in useful as surrounds for skylights, and had not yet used them, luckily! 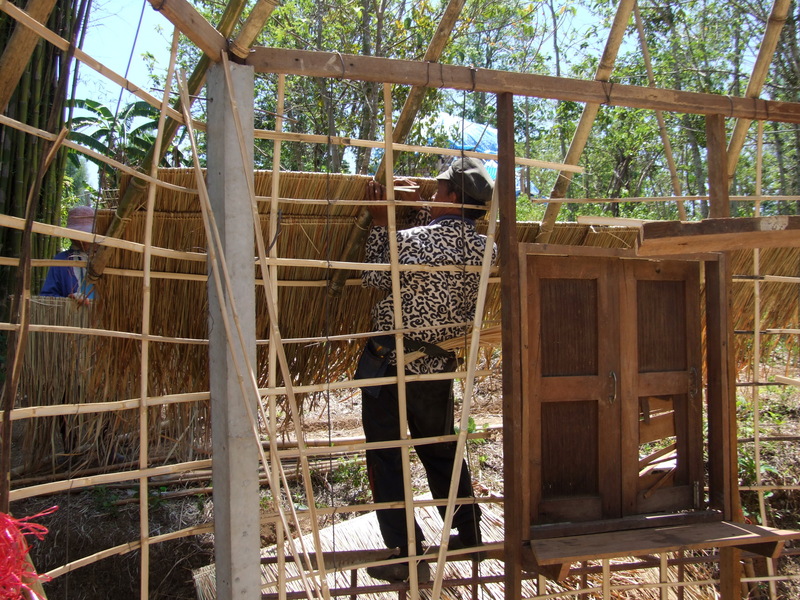 The ‘birdcage’ which will support both the thatch and rice-husk-bags. Littlest worker is playing with an old cow bell hanging on a red string. 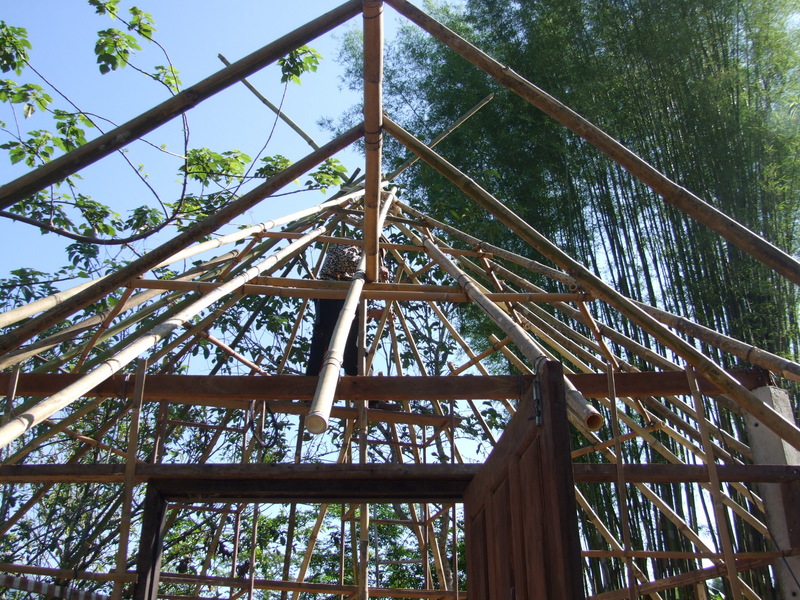 Interesting detail showing how to hang bamboo poles. 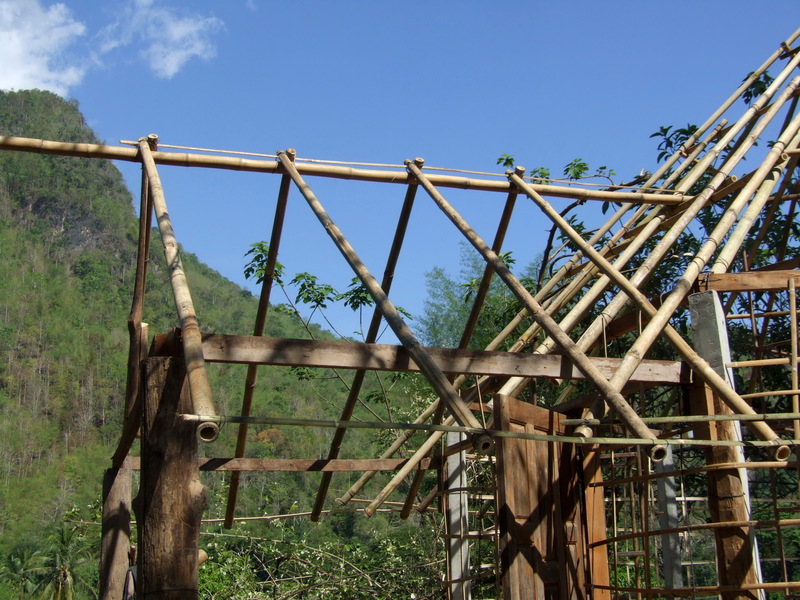 In order to hang the bamboo poles on the porch roof, holes were cut into the top of the poles and a thin piece of bamboo threaded through them. I’ve never seen that done before! The roof is leaning to the right! Horrors! We arrived this morning to find the roof had sort of twisted a bit and leaned over to the right! Luckily it did not seem too difficult to put right…. forever?! The first strips of thatch go up. Note the broken window …well, you probably already did! There are two windows the same, so this one is on site just to get the surrounds right, and the one that will be there permanently is having glass put in. Worker Bann shares his ice cream with Toni. The home made ice cream vendor is doing great business in this very hot weather! He knows he is always welcome on site on hot afternoons…. Next blog in 2 weeks – I should have moved in by then! My dream of living on my land is coming true much quicker than I expected. Do you have a dream? Are you on the way towards it? I would love to hear about it! All the people working on this project are from this village and people are always popping up the hill to have a look at how we are doing. It is a great atmosphere to live and work in. Maggi where abouts in Thailand did you say you are? The north rings a bell, near Chiang Mai? And your large cover photo at the top of the page is just beautiful! I’d love to hear what actually led you there in the first place. I am about an hour north of Chiang Mai in a place called Chiang Dao which literally means City of Stars, because at night the stars surround our wonderful mountain. The mountain is on the cover photo. How I got here is on the About page, which from your other post I know you have now read. Hope you are enjoying your rest before you begin to build!